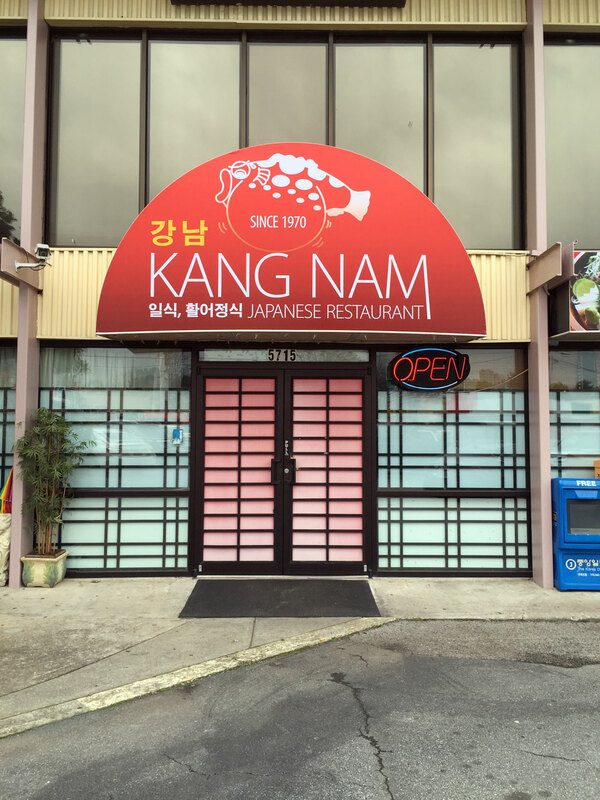 Kang Nam can be found at 5715 Buford Hwy NE, Atlanta, GA 30340 right outside of I285 (OTP) and across and up a block from the Buford Hwy Farmers Market. 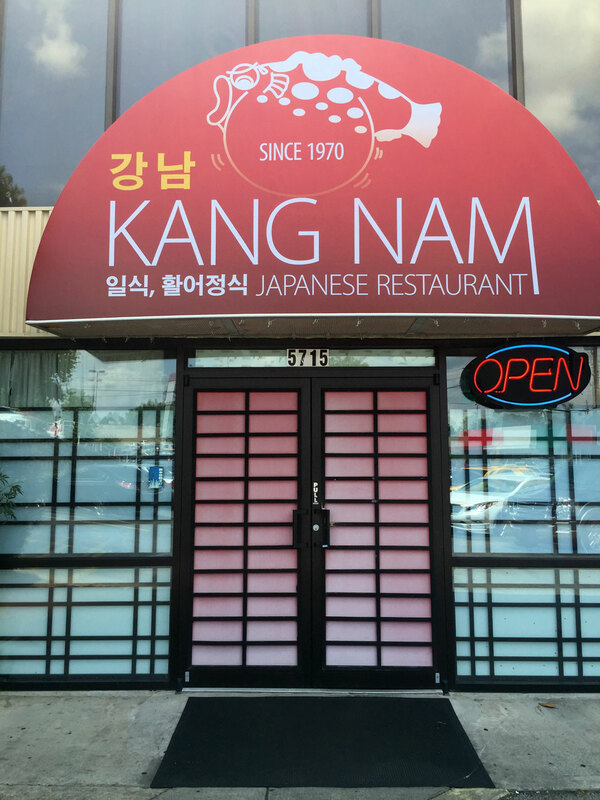 You'll see the bright red awning jutting out from the ground floor of a multi-story building. 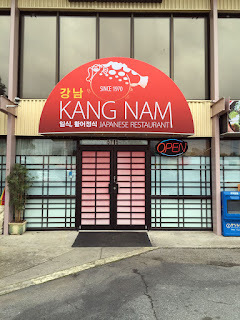 Kang Nam appears to be a Korean owned sushi restaurant and this isn't as strange as it might sound. 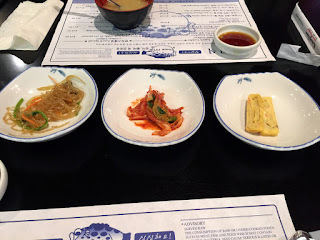 Both Japan and Korea have a fine tradition of raw fish preparation with common elements. 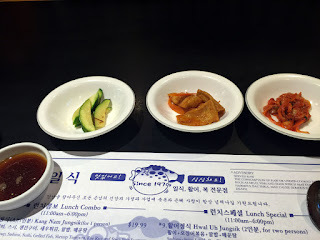 Some sushi aficionados may take issue with the heavier flavors and persistence of kimchee and other pickles provided as panchan as taking away the subtlety of the pure flavors of sushi, but I've found that the Korean tradition takes up these pickled meal accompaniments as part of the eating experience, incorporating them into every aspect. 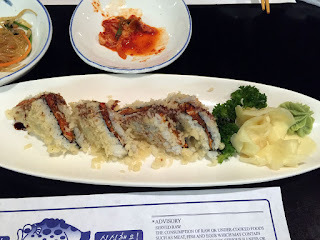 The food itself tends to be amped up a bit to compensate for the strong flavors - besides, if you look at traditional Japanese cooking there are a lot of pickles there that have very strong flavors - you just see less of them in sushi restaurants as they don't usually have the palate cleansing effect of the thin-sliced ginger so they are used less with sushi. 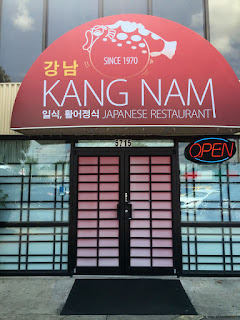 I had little to no expectations when we decided to try Kang Nam - I'd seen the awning before with little regard for trying it - especially with Sushi Hayakawa just a few blocks away. 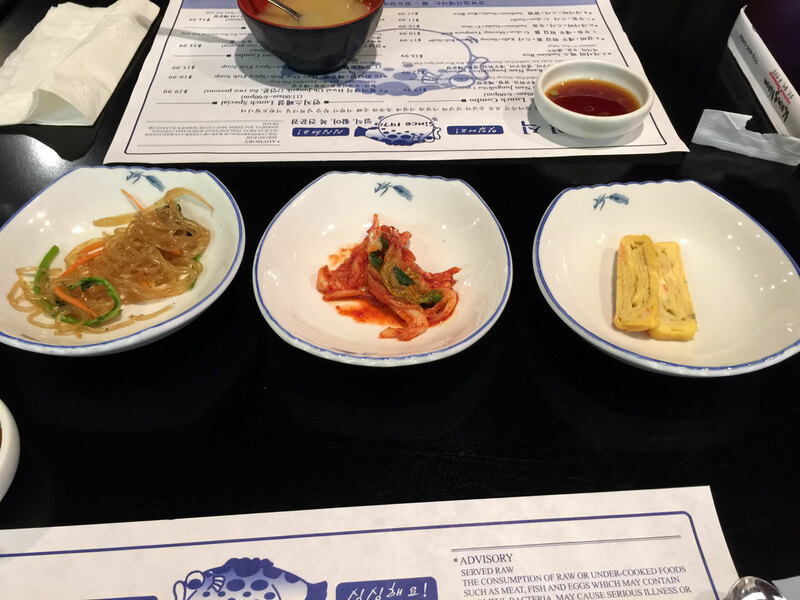 And too, some of my experiences with Korean-style sushi was a little less than satisfactory, but when my friend Sangam suggested trying it I was ready. The interior is on the smallish-side, however the booth placement allows for a more intimate, familial setting so you and your friends and family can gather around and share the food. 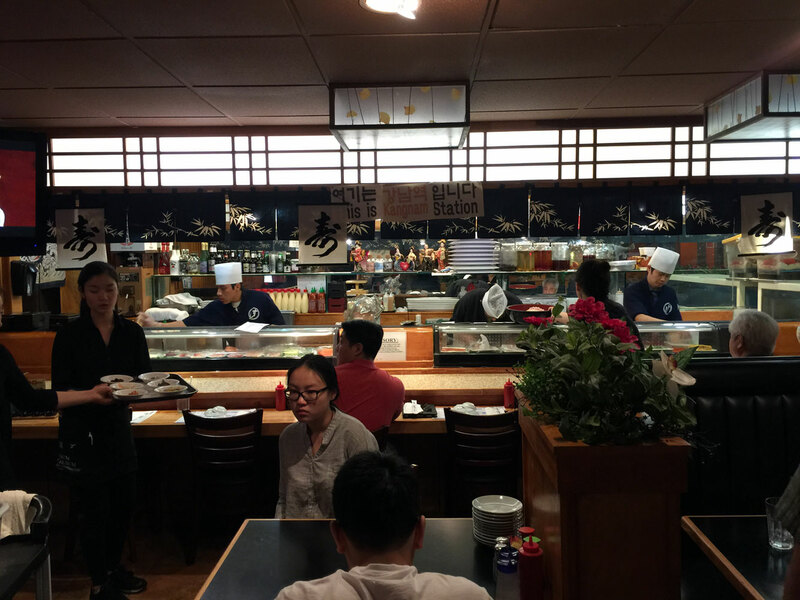 I like that a lot and it's something you don't often see in sushi restaurants (one exception is the traditional floor-seating at Nakato). 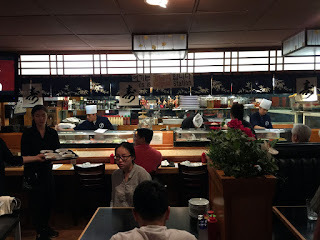 You are immediately greeted by staff and seated if there is space available - also you get the traditional greeting by the sushi chefs behind the counter. 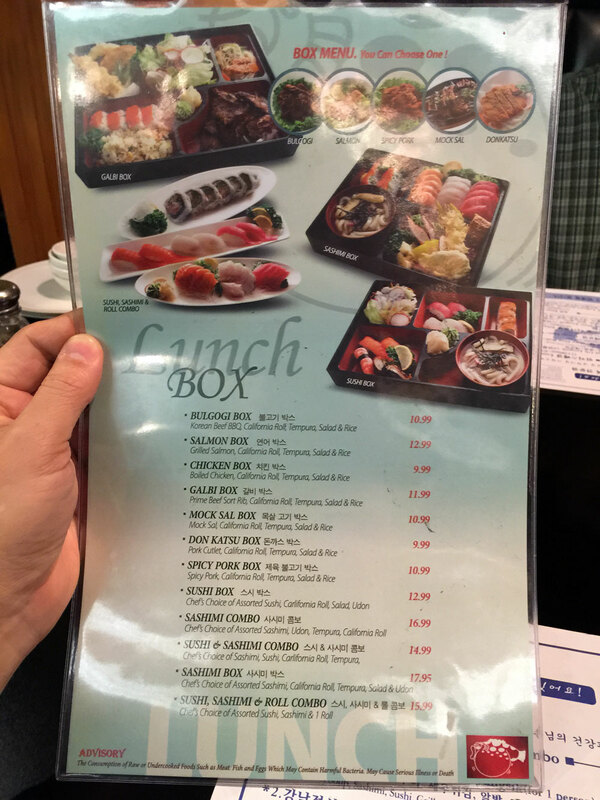 I've come here several times for lunch - I haven't tried the dinner yet so my opinions and impressions are in regard to lunch - keep that in mind as the bento boxes aren't available (I don't believe?) 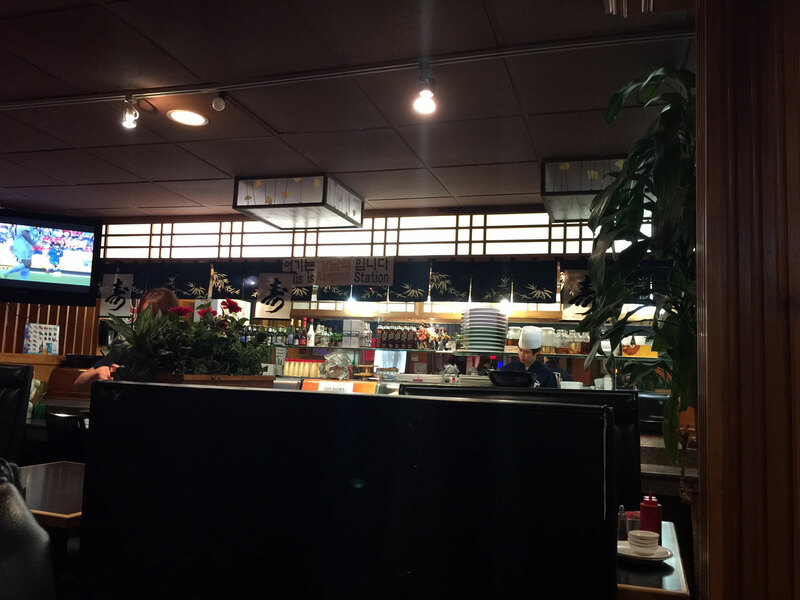 at dinner. 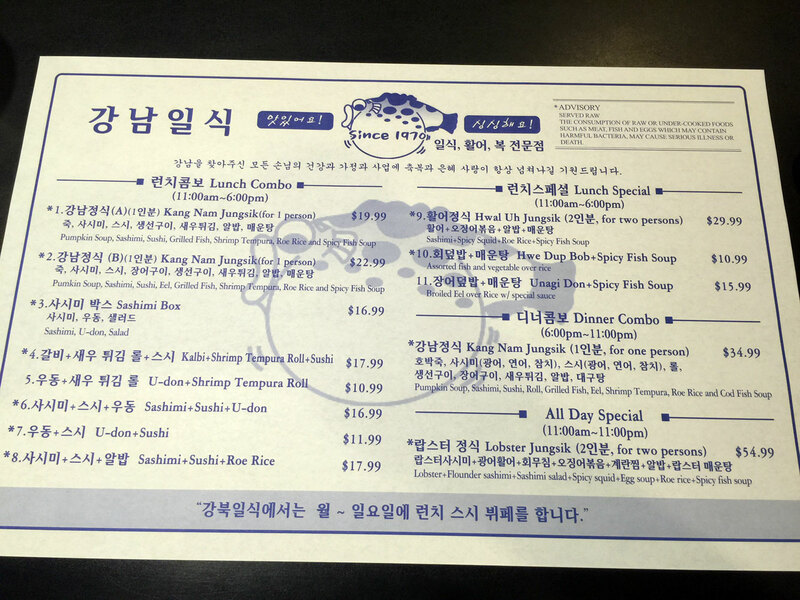 Once seated you have a paper place-mat with some simple menu options - I find that this is a unique feature in Korean restaurants that I like quite a bit. You're also given a laminated lunch menu that includes photos of dishes which is especially helpful for us dumb Americans (even though I was born in Korea, having lived almost all my life in the US I consider myself a gaijin or waeguk, even with my extensive familiarity with both cuisines). In any case, I used to not like bento boxes in general as they always seemed to lack something but recently I've decided the Korean bento is worth trying, especially for the value. And neither Sangam nor I were disappointed in the least! Sangam ordered the Salmon Box, which included grilled salmon, California roll, tempura, salad and rice. 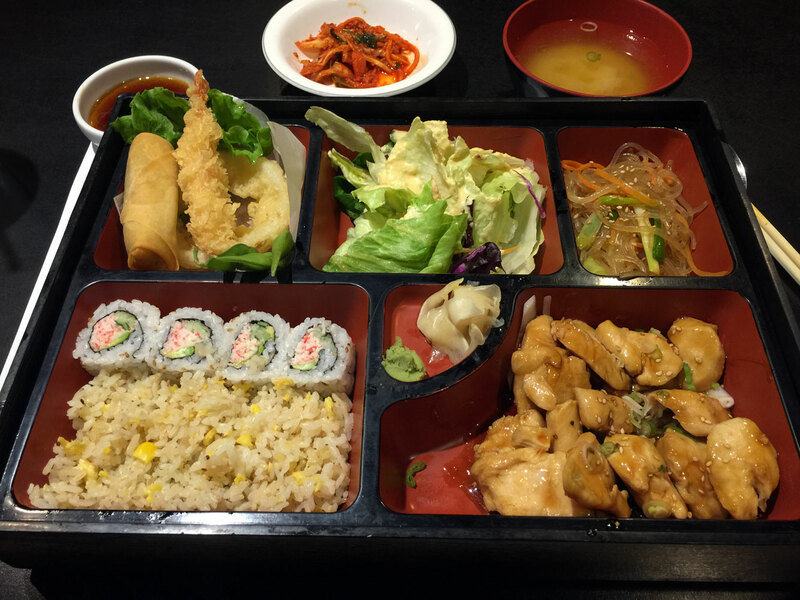 I ordered the Chicken Box (and have pretty much ordered it, the galbi box or the bulgogi box every time since)., which includes boiled chicken, California roll, tempura, salad and rice. 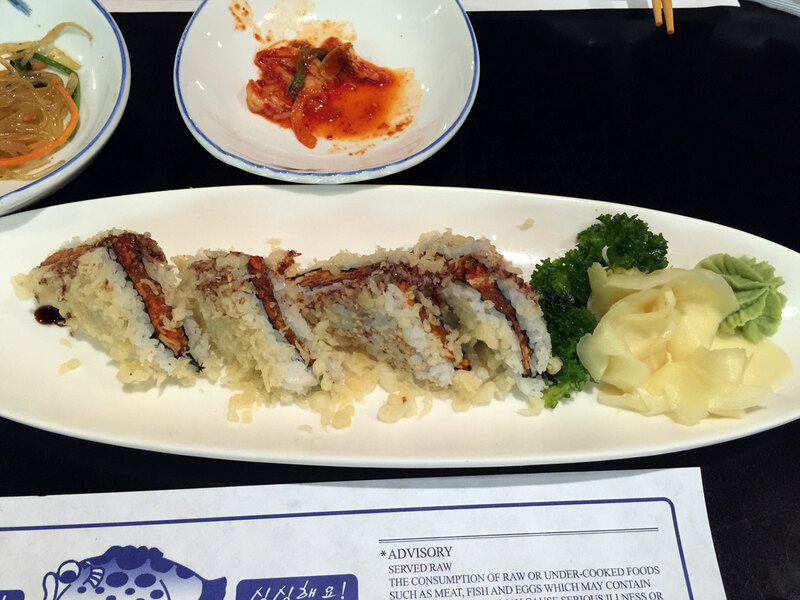 I also ordered a crunchy boxed spicy tuna (sort of little fish and rice sandwiches sliced diagonally) from the sushi menu to give it a try. This came with miso soup. Along with the panchan there was a ton of food! 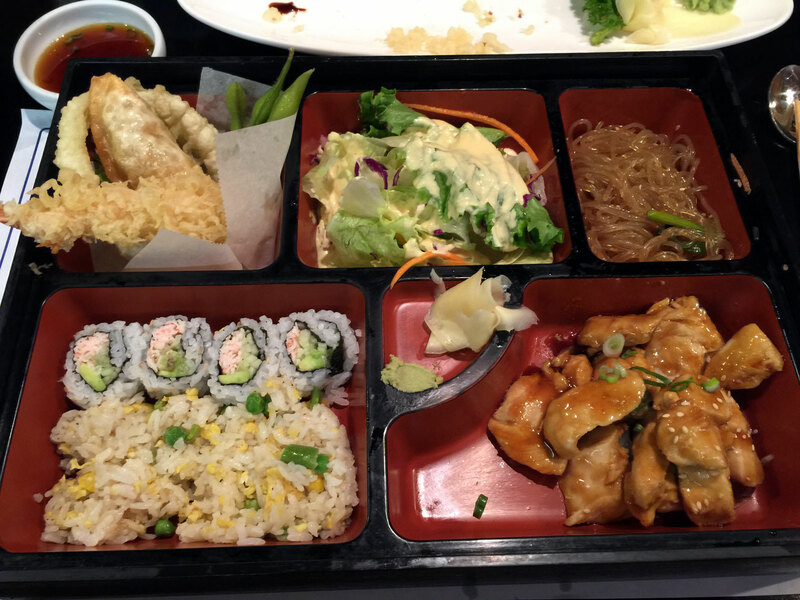 Wow did we over-order - even taking out time it was hard to finish everything and some bits got left. 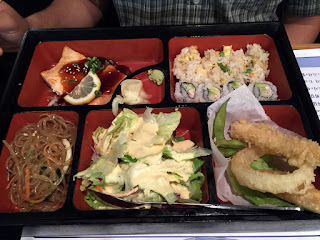 Some additional items in each of our bento boxes include a tempura onion ring, shrimp and mondu (fried dumpling) as well as a small pile of jabchae - the rice was also an egg fried rice and better than average. 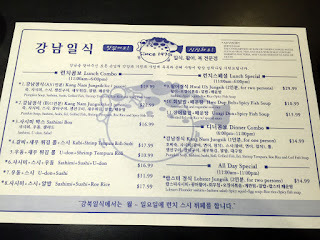 If nothing else you can eat here fairly inexpensively for lunch and have a bit left over to take with you, but actually the food is quite good and of above average in quality. 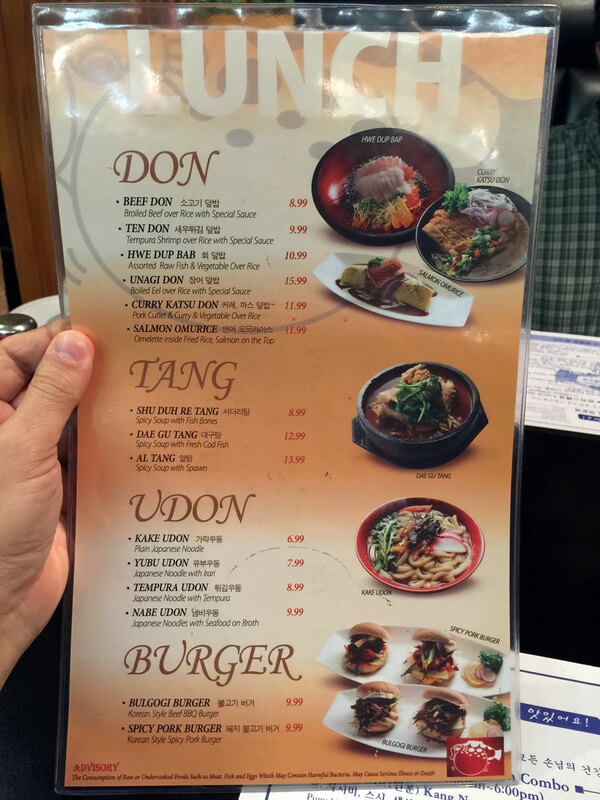 Service was very good with the staff super attentive. The sushi chef commented on my Superman emblem shirt - he had a similar one on under his tunic. Parking is a bit wonky as the lot is on the smallish side and appears to also be used for a bus pickup. 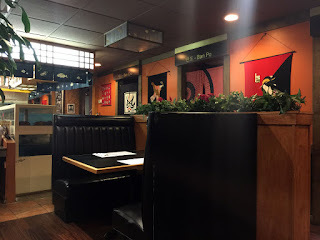 We still managed to park close to the door.